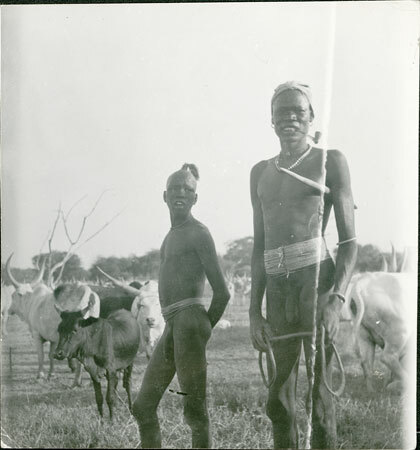 Two Mandari herders wearing bead waist strings, one holding a tethering rope and smoking a pipe. This was probably taken in Mandari country during his trip to see his student Jean Buxton. Morton, Chris. "Mandari herders" Southern Sudan Project (in development). 03 Jan. 2006. Pitt Rivers Museum. <http://southernsudan.prm.ox.ac.uk/details/2005.51.502/>.